During the Warring States period in Japan (late 16th C.), warriors honed their skills on the battlefield. Techniques were tested under a harsh and brutal system and those that passed were those that survived. In the many schools that taught the warriors of this age, wooden swords, or bokuto, were used lessen the danger the students faced. At this time, swordsmanship was known as kenjutsu. The Battle of Sekigahara (1600 CE) finally brought an end to the constant fighting, and with the reign of the Tokugawa shogunate, peace came to Japan. This peace allowed the arts to flourish, and fighting was discouraged, although not entirely wiped out. In order to continue to give students a sense of real combat without endangering their safety, more and more schools took up the use of the “shinai” as a training tool. Designed in the early 18th century, the original shinai was made up of many slats of bamboo in a silk or leather bag, which could be used to actually hit an opponent without causing the grievous injuries of steel or solid wood. Similar shinai are used by kendo practitioners today. Body protection (bogu) was developed to protect the head, wrists, and body. These are loosely modeled after the armor of the samurai, but much lighter--no doubt because most fighting would now take place in civilian clothes. In contrast to battlefield techniques, kendo strikes are made to the head, forearm, waist, and throat. These targets would have been the best–armored on the battlefields of the Sengoku period, but in the peaceful Edo period, sword duels were fought most often without armor of any kind and these targets were considered ideal for ending a conflict quickly. During the Meiji Restoration, an effort was made to wipe out all traces of the samurai, including the martial arts. Sword arts declined, but were not forgotten. In 1895, they were revived under the Butokukai (Martial Arts Association). 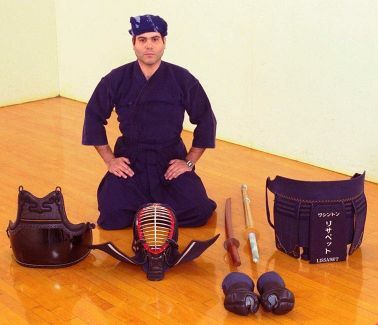 Then, in 1911, kendo was first introduced into the curriculum of Japanese schools. In 1912, the Kendo no kata (set forms) were added, to remind students that the shinai was supposed to represent a real sword. During the WWII era, kendo and many other martial arts came to be bound up in Japanese nationalism and were used to cultivate a warlike mentality among the people. After WWII, the Allies imposed a brief ban on all martial arts activities in Japan from 1945 to 1947. Kendo was re-established in Japan in 1952, and although it still maintains a basis in life-or-death struggle, the kendoka now devotes their training to developing their skills and character in a world where the sword is no longer a battlefield weapon.